Colors: Reuben Rude & I.H.O.C. In an alley in Manhatten, Leo can’t understand how Donny could be nothing more than a busted shell and a skeleton when just a few minutes ago, he saw a vision of him merely paralyzed and bleeding. Raph and Mikey assure Leo that Donny’s dead and to just move on, already (real sensitive, guys). Leo realizes, though, that the skeleton in the shell can’t possibly be Donny’s since it has ten fingers and ten toes. 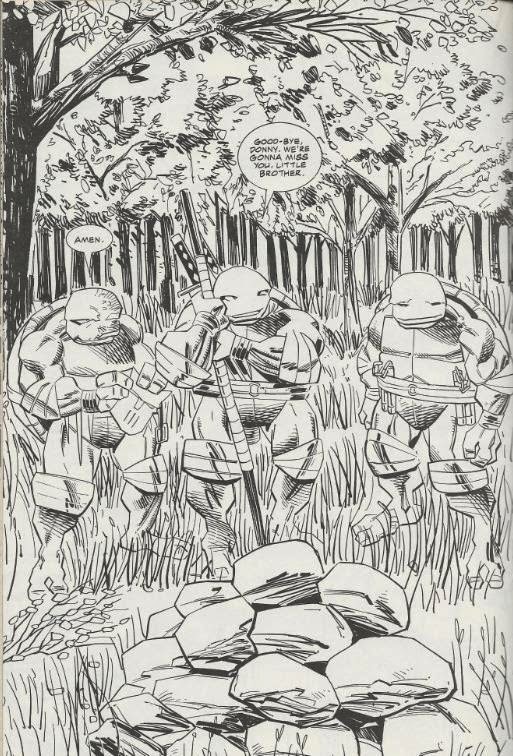 Rather than ponder Don’s whereabouts any further, the Turtles decide to go save Splinter and get revenge, instead. Mike grabs Don’s empty shell and the Turtles pile into the Triceraton aircar. They eventually arrive at the castle of Lord Komodo that Raph’s contacts in the Foot Clan and Mikey’s web-surfing had informed them about. Leo wants to wait until dark to infiltrate the place, while Raph wants to take a more direct approach. Mikey interjects and tells them they won’t be doing anything until they’ve buried Donny’s shell. Inside the castle, Splinter is attempting to prevent Mako the shark-man from eating the unconscious Dragonlord Komodo. Mako may be bigger, but Splinter’s ninja skills give him the edge, as he breaks Mako’s nose. Suddenly, several komodo dragons arrive to even up the odds. As Mako plays around with them, Lord Komodo wakes up and prepares to fight. Unfortunately, his diseased Bushido Spirit chooses the most inopportune time to have an attack and Lord Komodo is transformed into a humongous but mindless komodo dragon. Witnessing the transformation, Mako realizes that it would’ve happened in his stomach if Splinter had let him eat Lord Komodo and is, ever so slightly, grateful. As Mako makes his escape, Splinter declines the invitation to join him, as he wishes to stay and look after his host. Suddenly, Pimiko, the kunoichi and one of the Dragonlord’s scientists arrive on the scene. The scientist gives Komodo a vaccine to help him recover and sends several of his komodo dragons to go fetch the fleeing Mako. Pimiko quickly orders Splinter’s execution, as she believes he now knows too much. In the woods not far away, the Turtles have buried Don and are paying their last respects. Raph and Leo cut the eulogy short to go get some revenge, while Mike stays behind to sob. A few minutes later, the Turtles enter the cornfield outside Komodo’s castle. Suddenly, Mako comes bursting through the crops, being chased by a trio of single-minded komodo dragons. Mako hops into the Triceraton aircar and attempts to make his getaway, only to have Raph dump him to the ground with the car’s remote a half-mile away and re-park their vehicle. Elsewhere, Don recalls his last few moments of consciousness in the alley. 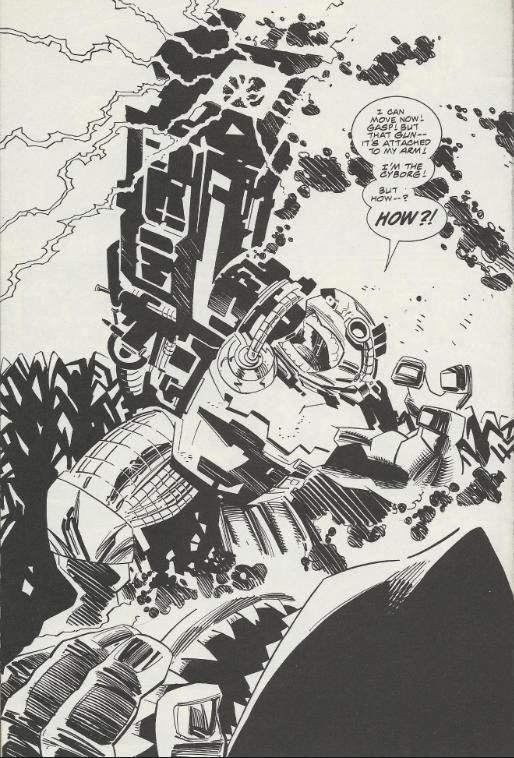 Right before he blacked out, the hulking form of the cyborg that fell out of the helicopter with him appeared looming over his paralyzed body. Don wakes up to find himself still paralyzed and, apparently, being carried off by the cyborg through a cornfield. They happen across the injured Mako and, despite Don’s warnings to run, Mako doesn’t budge and gets blasted by the cyborg. Don looks down at his arm and sees that it’s been transformed into a giant laser gun. Finally, it dawns on him: He is the cyborg. *This story is continued from TMNT (Vol. 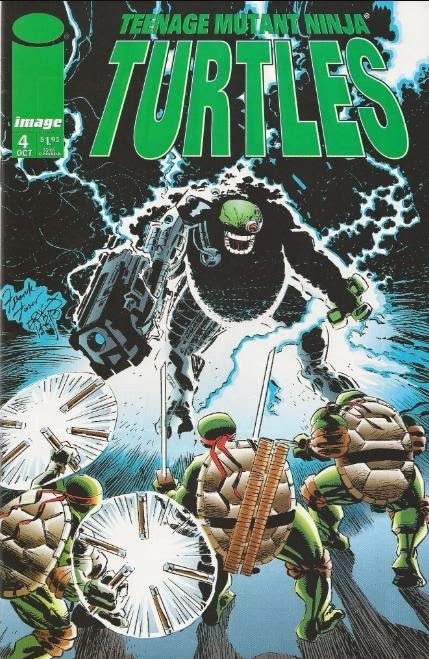 3) #3 and is continued in TMNT (Vol. 3) #5. *Mike and Raph deduced the Dragonlord’s identity and location in TMNT (Vol. 3) #2. 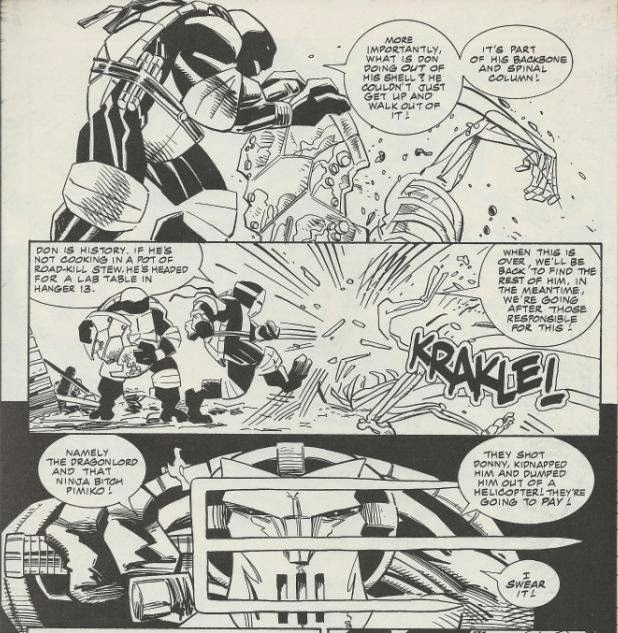 *According to Carlson in the letters page for this issue, after Mako was jumped and beaten to a pulp by the Freak Force in Savage Dragon #24, Komodo’s cyborgs took advantage of the opportunity and captured the injured shark-man. Carlson wins a Marvel No-Prize. During my first read through of Volume 3, this was the issue that ticked me off the most. As good a storyteller as Carlson is, he really dropped the ball with Don’s “death”. Aside from a single panel of Mike sobbing, none of the Turtles seem to really have much of an emotional investment in their brother’s death. I could almost accept Raph’s “tough guy” act to an extent, but his dialogue is just too over-the-top. “Don is history. If he’s not cooking in a pot of road-kill stew, he’s headed for a lab table in hanger 13.” Raph’s a jerk, but he’d never say anything that callous seconds after discovering one of his brothers just died. Mike is the only one who seems to give a damn and while that goes a long way, it isn’t enough. In this issue, the Turtles believe one of their brothers has died and even have an impromptu funeral for him. There should be a lot more emotion than what we got. The rest of the issue is handed over to a gratuitous battle with Mako the shark-man from Savage Dragon. Fosco draws a good Mako, particularly in regards to giving him the lifeless “doll’s eyes” of an actual shark, rather than overly expressive cartoon eyes. It makes him more frightening and imposing than he really deserves to be. Mako must have been Larsen’s favorite “loan-out” villain or something as I was first introduced to the character when he randomly popped up in The Maxx #6. He’s not much of a villain, just an extreeeeeeeeeeme! gorefest thug that happened to pop up in a bunch of Image titles during the 90s because he was so third tier that you could do anything to him and it wouldn’t disrupt the narrative of the Savage Dragon comic. As for Don becoming a cyborg, well, of the various “mutilations” that occurred throughout the Image series, I think I disliked this one the most. Raph getting his face melted off was pretty cool, Leo losing a hand was sort of swordsmanship-neutering but not a major drawback, but Don becoming a cyborg? I dunno, it just felt like a bad action figure promotion or something. If there’s any good news, it’s that I typically regard this issue as the worst of the entire Image run, so its mostly uphill from here. Though he definitely dropped the ball on what should have been a much more somber and reflective issue, instead opting for some extreme 90s blood and guts action with Mako the shark-man, the true depth of Carlson’s storylines will begin to blossom after this point. And hey, if the lowest point of your twenty-three issue series is #4, then meh, that’s not so bad.